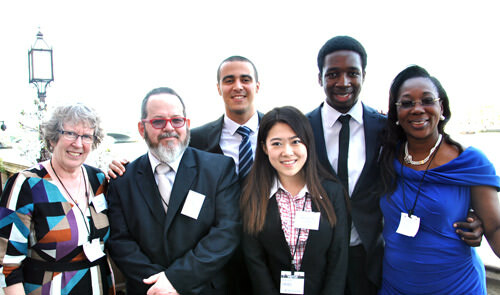 Every year CIFE awards a number of prizes to exceptional students from member colleges. To receive a prize does not just require top results, but exceptional contribution to college life. Competition is fierce, and we’re delighted to announce that Bosworth students received four CIFE awards, including the top Gold Award, which went to Stanislau Yatskevich. Stas followed a two year A level course at Bosworth College and achieved A* in all five of his A level subjects – Maths, Biology, Chemistry, Physics and Russian. He is currently studying medicine in Melbourne, Australia but has been accepted to read biochemistry at Oxford from September 2014. His main passion is the area in which biology and chemistry overlap and his stated aim is to understand how life works at the molecular level. Stas is also fascinated by history and is a published author of a historical novel. He has used his knowledge of physics to design and patent two medical devices on pumping of blood and laser scalpels. Alongside all of this Stas also found time to play football, work at the summer school and generally have fun and make the most of his experiences in the UK. He is an outstanding young man both personally and academically. Bosworth College is very proud to have been able to facilitate his success. Stas couldn’t receive his award in person, but the other three Bosworth award winners were able to attend the prize ceremony at the House of Lords, and are pictured below. From left to right the picture shows: Liz Carter, Principal of Bosworth College, a guest, and award winners Munir Abukder, Teresa Wang, Baba Bob-Soile, and another guest. Zhaoxi (Teresa) Wang received an Andrew Osmond Maths award. She took an eighteen month A level programme at Bosworth and achieved A* in Maths, Further Maths, Chemistry and Physics and an A grade in Chinese. She dropped just 9 marks in all 12 Maths units. She hopes never to have to take another IELTS exam as long as she lives, as getting the brilliant maths results was child’s play in comparison to 7.0 in each English skill at the same sitting. However, her determination got her there and she is presently studying Actuarial Science at The London School of Economics. Teresa described herself as ’composed’,’ logical’ and ‘determined’ in her personal statement – in our reference, we described her as ‘ambitious’, ‘intelligent’ and ‘talented’, ‘kind’, ‘spirited’ and a good friend. Babafikayomi (Baba) Bob-Soile also received an Andrew Osmond Maths award. Baba joined Bosworth in September 2011 to follow a 2 year A level programme. He achieved 600 out of a maximum 600 marks for A level Maths and 599 out of 600 for Further Maths. He also received gold certificates in 2011 and 12 in the Maths Challenge and a merit in the Kangaroo Round. He was a crucial part of the team that won the regional maths challenge, he received a silver award in Physics Olympiad and successfully completed an Open University course alongside A level study. When not competing in mathematical competitions, Baba plays basketball where he is a vital part of the Bosworth team. Perhaps more importantly, he was always very happy to help others, both in and out of the classroom, and was one of the most popular students within the student body. He is presently studying Engineering at St John’s College Cambridge. Munir Abukhder received a CIFE College Award for exceptional contribution to life at Bosworth. He joined us in January 2012 to follow an eighteen month A level programme. He achieved A* in A level Maths, A* in Arabic, A in Biology, A in Chemistry and C in AS Psychology, and is presently studying Medicine at Birmingham University. Prior to coming to the UK, Munir worked as a volunteer in the main hospital in his city during the peak of the Libyan revolution and saw and dealt with situations many seasoned doctors would have struggled to cope with. Despite having to put his education on hold for a year and arriving late because of visa issues, he started his A level course with enthusiasm and conviction.